Drinking water from a fresh coconut does more than just quench your thirst; it replaces electrolytes essential to maintaining your overall health. You'll often see fresh coconuts for sale on the beach in tropical vacation destinations, but coconut water is also available in cans or tetra packs in most grocery stores. Drinking refreshing, slightly sweet coconut water after a workout, on a hot day, or when you're ill can help replenish the electrolytes your body needs. Electrolytes are minerals found naturally in your body fluids, such as plasma. They're free ions that carry an electric charge. Electrolytes maintain proper muscle and nerve function as well as fluid balance in your body. You lose electrolytes when you sweat or lose fluid from your body such as when you have diarrhea or vomit. If you're lacking electrolytes you might feel dizzy, weak, fatigued, confused, or experience muscle spasms, numbness, twitching or blood pressure changes. It's important to replace the fluid and electrolytes you lose to prevent side effects. Coconut water contains the electrolytes calcium, magnesium, phosphorus, potassium and sodium. These minerals, suspended in water, occur naturally in the fluid of the coconuts. Each of the minerals plays a different role in your body in addition to functioning as an electrolyte. Calcium, which is the most abundant mineral in the body, and magnesium both help keep your bones and teeth strong. In addition to being electrolytes, phosphorus and potassium aid in energy metabolism and maintaining body proteins. Drinking coconut water is an excellent way to replace electrolytes in your body. Often people consume sports drinks to achieve this. However, a study published in the June 2002 issue of the "Journal of Physiological Anthropology and Applied Human Science" indicates that consuming coconut water after exercise may be a more effective way to rehydrate than drinking plain water or a sports beverage. 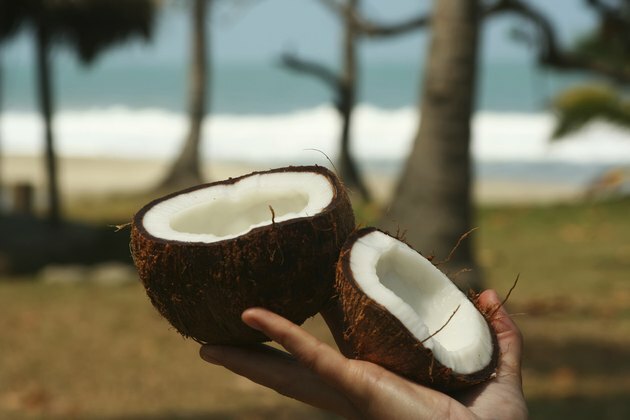 Among the study participants, the coconut water caused less stomach upset and had a flavor they preferred over water and a carbohydrate-electrolyte beverage; it also effectively restored water and electrolyte levels. Furthermore, coconut water is all natural, free from added sugar and doesn't contain artificial ingredients or food colorings. If you're very sick or hospitalized in an emergency, you may require intravenous fluids to rehydrate and replace electrolytes quickly. Typically, lab-prepared sterile saline solutions are used in IVs. However, according to an article published in the "American Journal of Emergency Medicine" in January 2000, coconut water can replace IV fluid in remote parts of the world or in emergency situations. The article reports of a case in which electrolyte balance was successfully restored in a patient by treating him with an IV of coconut water, which flowed directly from the coconut. Medical News Today: What are Electrolytes? American Journal of Emergency Medicine: The Intravenous Use of Coconut Water; Darilyn Campbell-Falck, MD, et al. Journal of Physiological Anthropology and Applied Human Science: Rehydration After Exercise With Fresh Young Coconut Water, Carbohydrate-Electrolyte Beverage, and Plain Water; et al. What Are the Benefits of Coconut Water During Pregnancy?